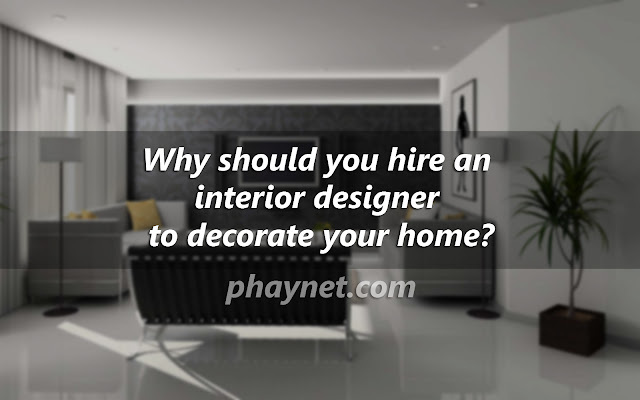 Why should you hire an interior designer to decorate your home? Why should you hire an interior designer to decorate your home? - Your home is the ultimate shelter where you have to spend the entire life. So, make it a dream place along with all the comfort. If you are planning to build a home, here are some reasons to hire expert interior designers for the beautification of your residence. Today, people are so conscious about some basic requirements, home is one of them. It is no more a mere question of accommodation, but something more than that. It should reveal your passion, style, taste and personality. Here comes the need of hiring interior designers for a well-decorated and elegant dwelling. But, in Kolkata, there is still a wrong belief that designing a home is quite a matter of luxury. But the fact is you will get a handful of advantage of appointing designers. Let’s see what they are. The interior designers interprets your requirements and makes a professional plan based on the style and the module of your residence and on your personal likes and dislikes. Their experience helps them to understand what is suitable for what. They can also give you advices on the relevant building application process, research, planning legislation, and can also help you in the hiring of assessors and workers and can ensure that construction policies are being followed. They assist you in the decoration of the furniture and other things in proper order to make your home the dream place. Do you think hiring a professional interior designer is expensive? Then, you have no idea how much it can cost if you want to do the whole process by yourself. Purchasing new materials or technologies without expert advice can be wrong and costly. If you hire interior designers in Kolkata, they can easily figure it out and can help in avoiding disasters and the whole process of decorating your house will be smooth. The interior decoration of your house consists of many big and small things which is quite difficult to do alone. Interior designers help you in sorting out the various designs and also assist you to choose which one is suitable for your residence. From planning your room, kitchen and lavatory to designing your furniture structure, everything will be done by them. Choosing the experienced designers can keep your budget in control. If you want to decorate your home with less expensive but classy furniture, they can give you the right information. they can build contacts with the architect and many home designing industry. An interior designers in Kolkata knows the proper places to acquire right resources that is required for your home. Moreover, he can give you whereabouts about the connections and general merchandise, which is not possible for you to know. You don’t have to research on products, brands and price and this will save your time too. Though, interior designers put their ideas to decorate your home, but they do it based on your personal opinion. So there will be a touch of individuality.